Adding to this mix is the fact that many users now interact with brands (and by extension, promotional offers from brands) via their social networks, instead of email. A user is more inclined to respond to an @reply or direct message (on Twitter) compared to a conventional email blast from a marketer. Given all this, it surprises me that email is still a primary vehicle for promoting physical and virtual events. 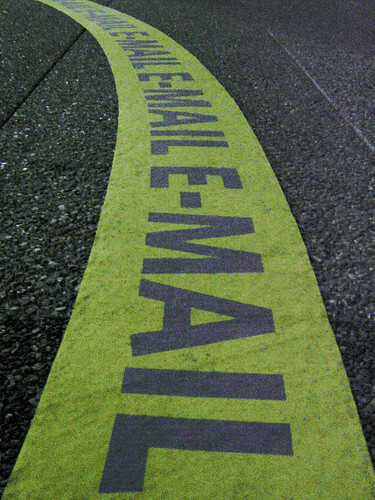 Event marketers have much to gain by thinking outside the inbox. Your first step outside the inbox should be in the direction of social networks. Build a presence in social communities and you’ll find that you naturally generate interest and awareness to your event. Previously, I wrote about leveraging Twitter to promote your virtual event. As Ian McGonnigal (GPJ) astutely pointed out, those same tactics apply quite well to physical events as well. Create a LinkedIn Event for your event – a LinkedIn Event page allows you to post relevant information about your event on LinkedIn (e.g. date, event content, etc.) – LinkedIn members can then indicate whether they’ll be attending, not attending or “interested”. This can be quite useful, as folks often attend events based on knowing whom else will be attending. By creating a LinkedIn Event, you’ll receive the benefit of having LinkedIn auto-recommend your event to other members, assuming their profile is a “match” with the profile of your event. Members may also utilize search and find your event. More info can be found on the LinkedIn blog page announcing the Event feature. Post videos to YouTube – it’s the #2 search engine after all (behind parent Google), so having event videos posted on the site will generate traffic from the millions of folks who visit YouTube.com each day. Record videos of your host, keynote speaker, group publisher, etc. talking about your upcoming event – if your keynote speaker has a prominent name, your videos will attract interest from users who search on that name. When you have a critical mass of videos, create a YouTube channel. About.com has a neat guide on how to do just that. Create a Facebook Fan page for your event – with a fan page, you’ll generate interest for your upcoming event – and, you’ll build an ongoing community that you’ll be able to continuously leverage! The All Facebook blog has a nice guide on how to build a Facebook fan page. Leverage blogs – author a blog posting on your corporate blog – or, if you don’t have one, ask a relevant industry blog site whether you can author a guest posting. Alternatively, leave a comment on postings from relevant industry blogs with a pointer (link) to your event. The key here is not to over-promote your event – your first goal is to provide useful and relevant content/commentary with your event being a secondary (and subtle) mention. If you pay attention to search engine optimization (SEO), your event page(s) will receive “organic” traffic – that is, traffic that finds you, rather than you finding the traffic (i.e. the “pull” from users searching, rather than the “push” from your email promotions). Think about the search keywords that you’d want to associate with your event [e.g. when users are performing searches] and make sure the content on your event page is rich in those keywords. Facebook advertising – purchase targeted ads on Facebook. For a physical event, you can target by geography (e.g. starting with users who are geographically close to your event site). For a virtual event, geography is less important, so you may want to target based on attributes in the users’ Facebook profiles. You can pay per view (of the ad) or per click (on the ad), so the terms are flexible. eHow has a good overview on Facebook advertising. Content syndication – purchase web syndication with online publishers in your industry – get your event listed in their directories, content sites, etc. They may charge you per click or per lead (completed registration). Not only can this generate registrants for your event, but it also improves your page rank by generating more inbound links to your event page. Hopefully I’ve covered a few “outside the inbox” options for you to consider – certainly continue to promote your event via email – however, use some of these options to lighten the load a bit on your email marketing lists. This entry was posted on Saturday, November 21st, 2009 at 9:50 PM and is filed under Virtual Tradeshows (VTS). You can follow any responses to this entry through the RSS 2.0 feed. You can leave a response, or trackback from your own site. That’s a great article! Thank you, Dennis! One more I would add is: Use images effectively. If you have the right images and tag them appropriately you will often get a ton of organic search hits from the images. Also thanks for the mention! Thanks, Ian – and good point. Continuing on your point, event planners who utilize Flash content on their event marketing pages should take care to make the Flash SEO friendly, as search engines can now index the text content that’s rendered within Flash. how about using flash banner ? any suggestion using banner advertising ? Flash banners can be effective, but keep in mind that click-thru rates (CTR) on banners have been in steady decline, so you’ll need to carefully review banner placement and content – and whether your target audience is likely to take action.